What started off as a passing thought: "I wonder if I could get a national team shirt from all 208 countries in FIFA?" became almost an obsession. FIFA has since become 209 nations with the inclusion of South Sudan and contacts, links and friendships have been forged with people the world over. The result of all this is a network of shirt collectors with similar aims, and in some cases a surplus of shirts for particular teams, including Ex-FIFA and non-FIFA groups. Not a day goes by without me receiving an e-mail from a football fan desperate to get hold of a shirt from a minnow of the footballing world, more often than not this is e-mailing is from Lebanon asking where I bought my shirt (www.classicfootballshirts.co.uk in case you were wondering). When I post new photos I'll often get people asking how they can also get hold of these shirts. To help other collectors, and to help me spread the cost of postage, bank fees and handling fees I have decided to set up a small online shop to sell my duplicate shirts: http://www.footballshirtworld.co.uk I will not be selling off my collection, but instead increasing the number of shirts when ordering. My Football Shirt project will always take priority! 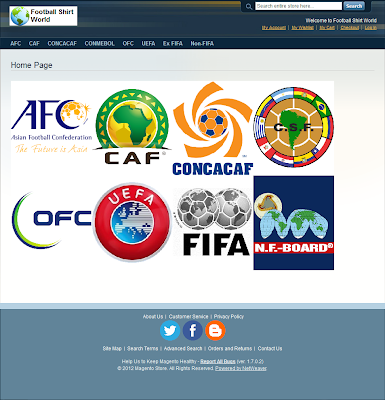 I have arranged shirts by continental confederation, with ex-FIFA and non-FIFA countries listed seperately. If there's anything that you are after which is not in stock then do get in touch.